With the lab processing finished in Akkeshi (see Rachel’s blog “Sayonara Hiroshima”) we said goodbye to our ZEN colleagues and began a whirlwind sight-seeing adventure of the Japanese countryside. We must confess that we were a little intimidated at first. We relied so much on our new friends to translate for us and explain Japanese customs that venturing out on our own to explore the country was a little scary. Equipped with a pocket dictionary, a few maps, and a Japanese rail pass we boarded the train at the Akkeshi station excited and full of anticipation for the sights and sounds that were ahead of us. After a 5-hour train ride across the beautiful, green hillsides of Hokkaido, we made our first stop in Sapporo. Sapporo is the largest city on Hokkaido and is most famous for its breweries. 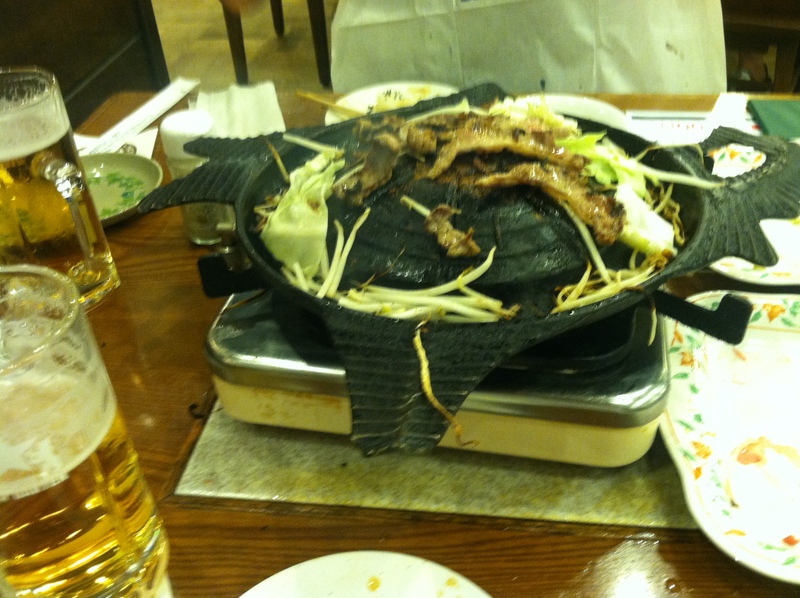 That night we stopped at the Sapporo Beer Factory for a lovely feast of fresh lamb and vegetables that were brought out raw for us to cook over a heated grill right at the table. We enjoyed the delicious food and beverages while talking about our research, life as a graduate student, and our plans for the upcoming semester. 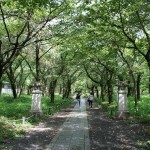 The next morning we toured the botanical gardens of Hokkaido University. It was a little late in the season to see the flowers in bloom, but the pathways through the woods were beautiful. However, we quickly learned that Rachel’s injured ankle was not up for the task. 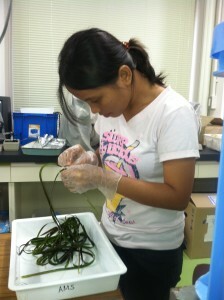 A few days before, Massa-san had taken us to the intertidal to show us the different types of eelgrass found in Akkeshi Bay. Rachel had twisted her ankle in the rocks and the squeezing of the waders we were wearing had only intensified the injury. We decided that the ankle definitely needed some doctoring before we continued our walking explorations, which was an adventure in itself. It took some trial and error in communication while asking for directions, but we finally made it to a drug store to buy wraps and bandages. Rachel looked forward to the upcoming train ride to rest. We were fortunate enough to have the opportunity for an experience that not many tourists enjoy – the 22-hour Twilight Express train ride from Sapporo to Kyoto. This train travels along the Sea of Japan down the entire coastline of the main island of Honshu. It was very difficult to get tickets for this train. It is popular among the Japanese during their vacation time and Hori-san had to be very insistent during a conversation with the booking agent to ensure we had reservations. We are so grateful for his effort! The coastline was spectacular, especially as the sun began to set. 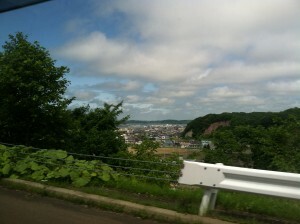 Our eyes were glued to the window as the train reached the more southern towns and villages. We had excellent accommodations for the journey in a shared compartment with room for 4 people. We shared the room with an older man who did not speak much English but was very kind and insisted that we see the “Golden Pavilion” when we stopped in Kyoto. 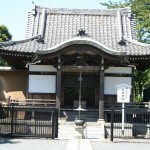 Kyoto is known as the cultural capital of Japan. We only had 20 hours to see as much of the city as possible and we did not waste a minute of it. After settling into our youth hostel and grabbing a quick lunch at the “ZEN Café” (! ), we put on our sunscreen, grabbed our fans, and began walking through the city. The receptionist at the hostel mapped out a touring path for us and we were not disappointed. 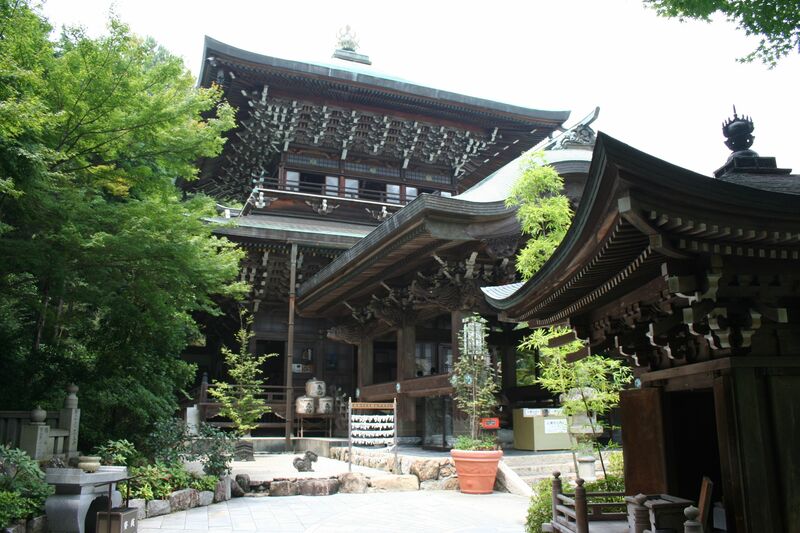 Our journey took us through a maze of temples, shrines, gardens and shops. In the evening, we ended up in the Geisha district of Gion and saw a Geisha cultural performance at a local theater. The show involved a traditional tea ceremony, harp-playing, dancing, and short plays. Dark had fallen while we were in the theater, and we walked out onto cobblestone streets lit by paper lanterns. After dinner in downtown Kyoto we made our way back to the hotel to ice our ankles swollen from a day of walking. Nicole also had an injured ankle from a sprain involving a slippery staircase a few weeks before. The next morning we boarded the train for the western part of the city. There we explored a ZEN temple and garden that included a long grove of bamboo. The dense canopy of bamboo was magical and a highlight of our Kyoto experience! 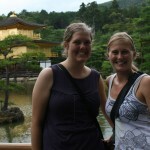 From there we ventured to the Golden Pavilion as recommended by our friend on the train. It was well worth the long walk from the train station, the temple was so dramatic in its intensity. After bowls of ramen noodles (these noodles were definitely not your typical college student’s ramen) and green-tea flavored soft serve ice cream, we caught the bullet train to Tokyo. With the speed of the bullet train we made it to Tokyo in just over three hours and just in time for rush hour. Our connecting train from Tokyo to Narita (where we would be staying for the night and where the airport was) was packed face-to-face. It took us nearly 2 hours of wading through a dense sea of people with gigantic luggage bags before we reached this outskirt of Tokyo. Exhausted, we both agreed to pay for a taxi to take us from the train station in Narita to our ryokan for the night. A ryokan is a hotel of traditional Japanese style and we slept on futons in a tatami matted room. 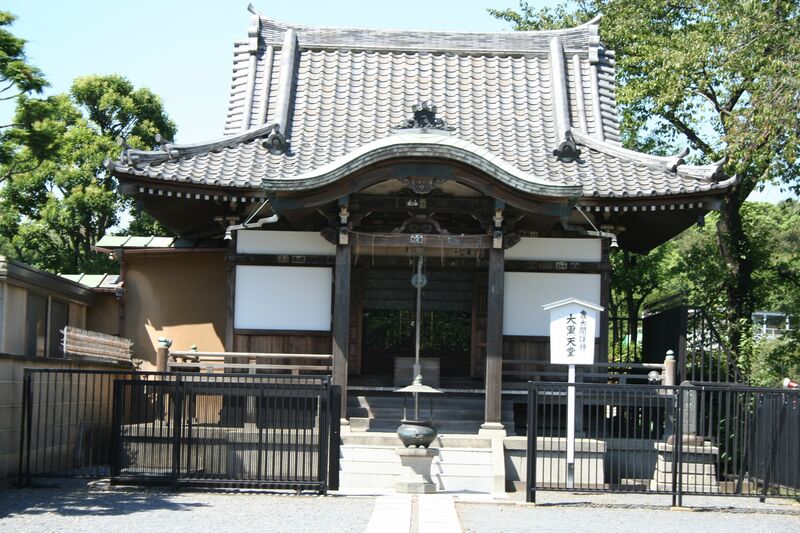 Across from the ryokan was a beautiful suite of temples, shrines, and gardens – perfect for exploring the next morning before we had to leave the airport. We arrived at the airport with 6 hours to spare. We wandered around the airport shops, had our last lunch in Japan, and re-pack our luggage to shove in all the extra souvenirs we were bringing back to our families and friends. Finally, it was time to go our separate ways – Rachel to San Francisco and Nicole to Los Angeles to catch connecting flights to our homes in North and South Carolina respectively. 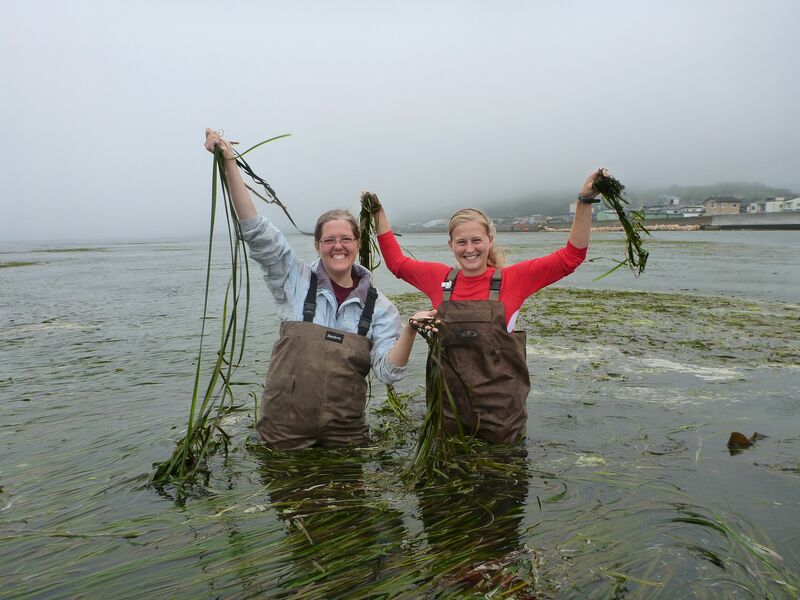 Grateful for the journey through Japan together and the friendship forged, we knew we would see each other again soon – whether it be at conferences, while visiting each other’s laboratories, or in another eelgrass bed. After nearly a month in Hiroshima, it was almost time for me to make my way to Akkeshi to help Dr. Nakaoka and Nicole Kollars, the other ZEN graduate fellow in Japan, process samples post-breakdown of the ZEN main experiment. 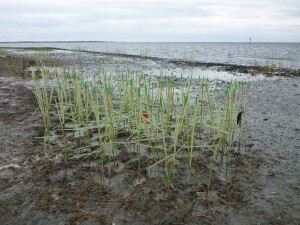 The experiment tests the interacting effects of mesograzers and nutrients on seagrass ecosystem function through the use of a grazer deterrent rather than traditional caging techniques. 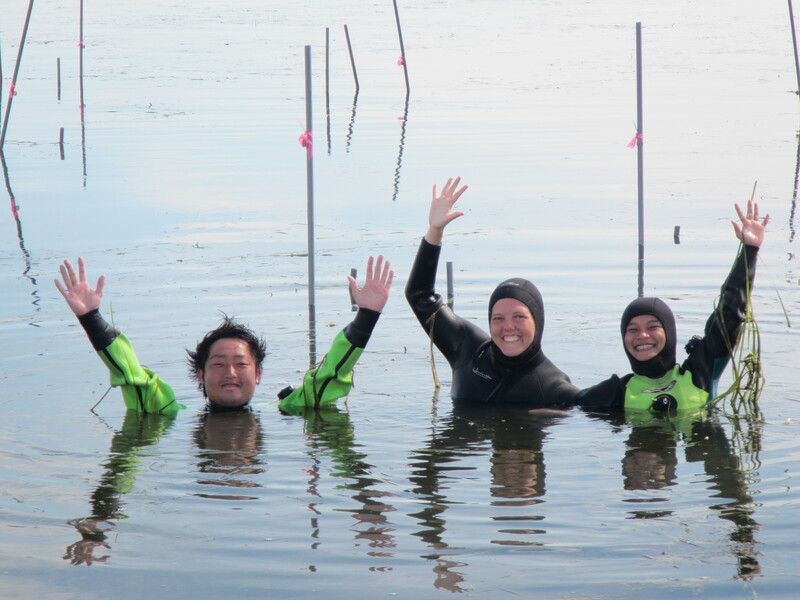 Before I left Hiroshima we had one more experiment to run testing the roles of predators in local eelgrass beds, and then I was off to Tokyo for a few days with Hori-san. Conducting assays to test the strength of predation by small fishes and crustaceans on mesograzers at our field site was a fairly straightforward process, but was particularly challenging when the tide was up and the current strong. We experienced both of these conditions during our last predation assay. 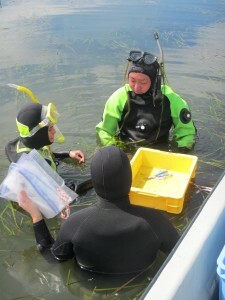 The water was too deep for setting up the assay by snorkel, so Hori-san and Hamaoka-san completed the assay with SCUBA. 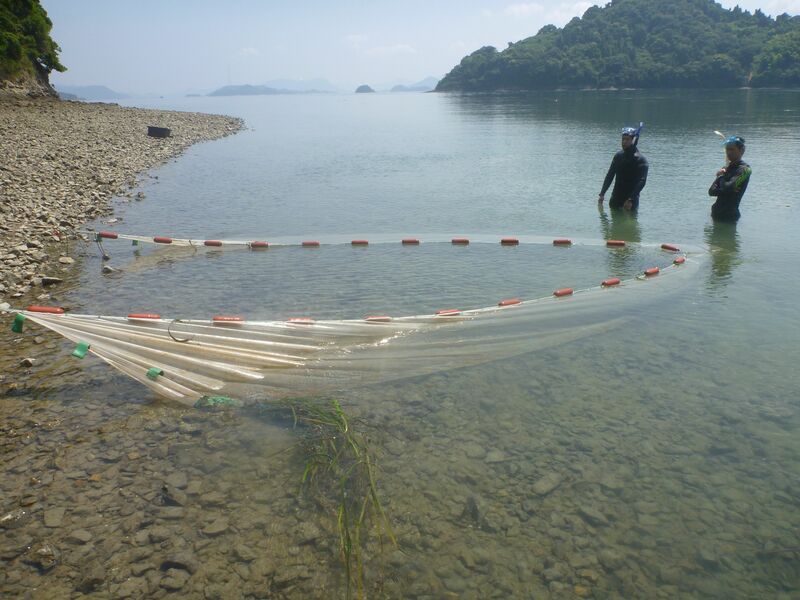 Shimbukoro-san and I used snorkels to set and collect minnow traps, which provide data on the abundance and composition of the ambient predator community. 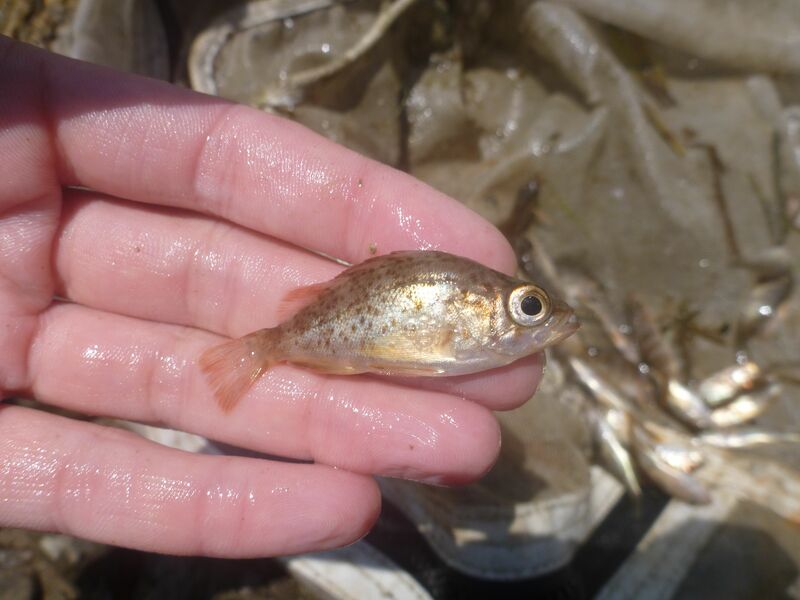 We caught several small fish in each of the minnow traps, primarily gobies and rockfish, but we decided to conduct additional fish sampling using a modified seine to get a better representation of the fish diversity at this site. 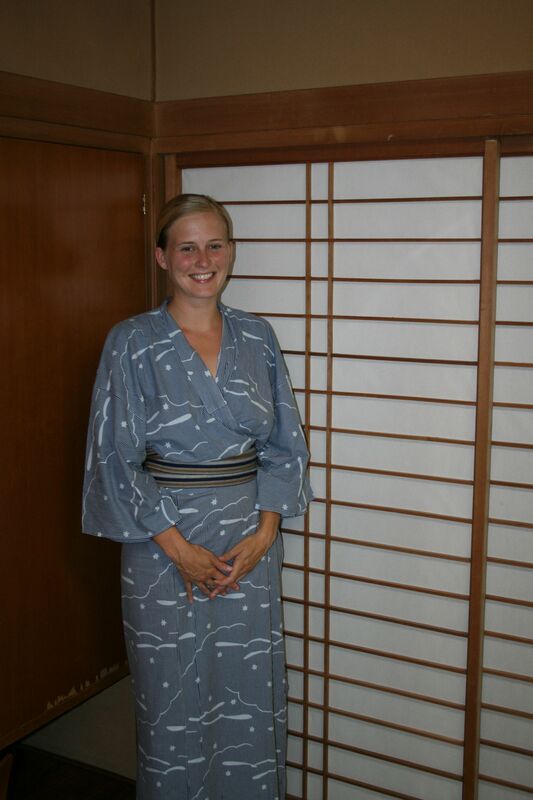 On my last day in Hiroshima, the lab surprised me with a Yukata, a summer time kimono and a farewell dinner. 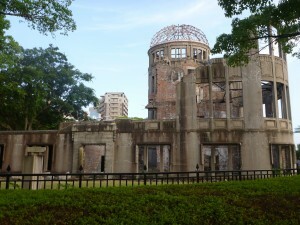 The next morning as Dr. Hori and I headed to the airport, I grappled with the realization that my time in Hiroshima was ending. This was not an experience I was likely to forget, but I knew that I would genuinely miss my new friends. Before heading to Akkeshi to help Dr. Nakaoka with the ZEN experiment’s at the northern Japan site, I spent a few days in Tokyo. Tokyo is overwhelming to say the least; just stepping off the train into Tokyo Station makes you realize how large and bustling of a city it really is. 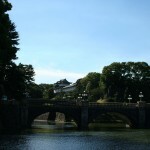 You could spend an entire day just in the train station with all of the shops and restaurants, but fortunately I had time to make it out of the station and see two of the major tourist attractions in Tokyo: the Imperial Palace and Ueno Park. 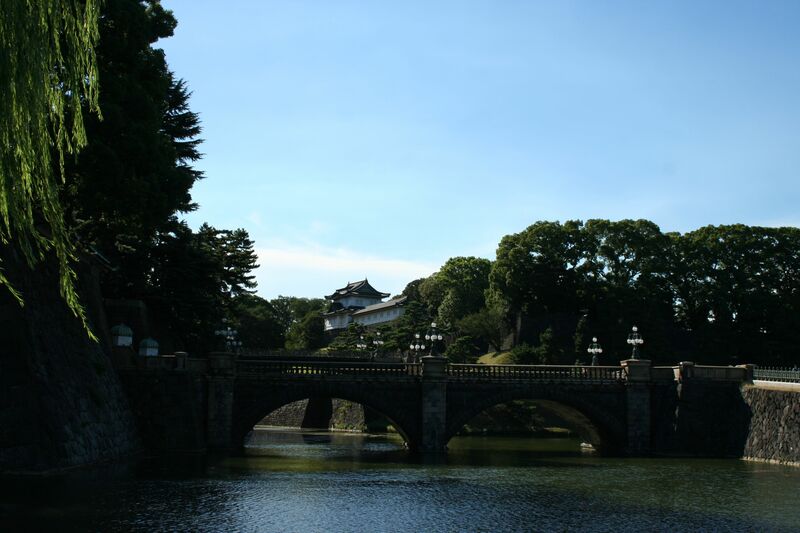 Although you can only enter the palace two times of the year (new Year’s day and the Emperor’s birthday) without a scheduled tour, just seeing the outside of the palace was worth the walk in the hot August sun. 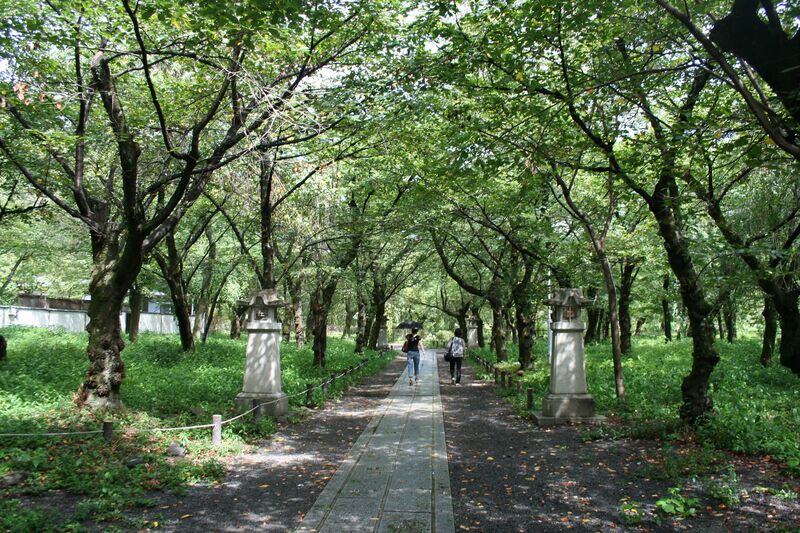 Ueno Park is a large park in central Tokyo that includes numerous museums, temples, shrines, and a zoo. 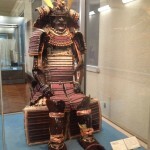 Although I didn’t have time to see it all, I enjoyed the exhibits in the Tokyo National Museum and visiting the shrines and temples throughout the park. 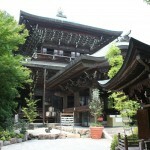 From Tokyo I headed north to the town of Akkeshi where I would spend the next week assisting with the ZEN research. 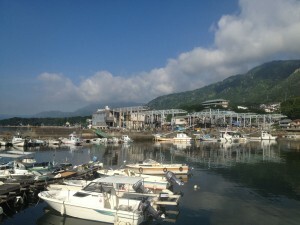 Compared to the fast pace of Tokyo, Akkeshi is like a different world. 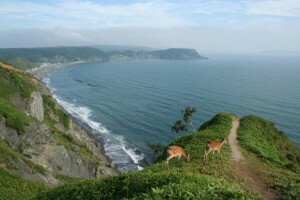 Akkeshi is a small, quiet fishing town on the Pacific coast of Hokkaido, the northernmost island of Japan. 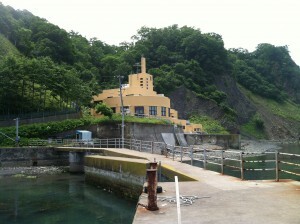 The marine lab where the northern Japan ZEN team was based is located just outside of Akkeshi, within a National Park. After a warm welcome from Dr. Nakaoka, his wife, the lab and a minor earthquake (although it didn’t feel so minor to me), I jumped into sample processing. The fieldwork for the main experiment (see Nicole’s blog) was complete, but we had a lot of samples to process in a very short time. Although I had processed samples for ZEN in North Carolina before, sample processing in Akkeshi was a little different. Simply put, everything is just bigger in Akkeshi. 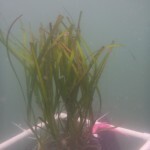 The seagrass is bigger, the grazers are bigger, and, naturally, the epiphytes are bigger. Filtering the epibionta scraped from the eelgrass shoots was a challenge because of the large scale of all of the organisms. Fortunately, because of the dedication of the lab, we were able to complete sample processing in the week that I was there and I still had time to hike to the top of the cape above the lab with Nicole and witness to breathtaking sunsets. We also made sure to sample some of the delicious ice cream made fresh from a local dairy just outside of town. Before I knew it, it was time to leave Akkeshi, but not before we spent our last night eating sushi and celebrating with the lab at a wonderful local restaurant. 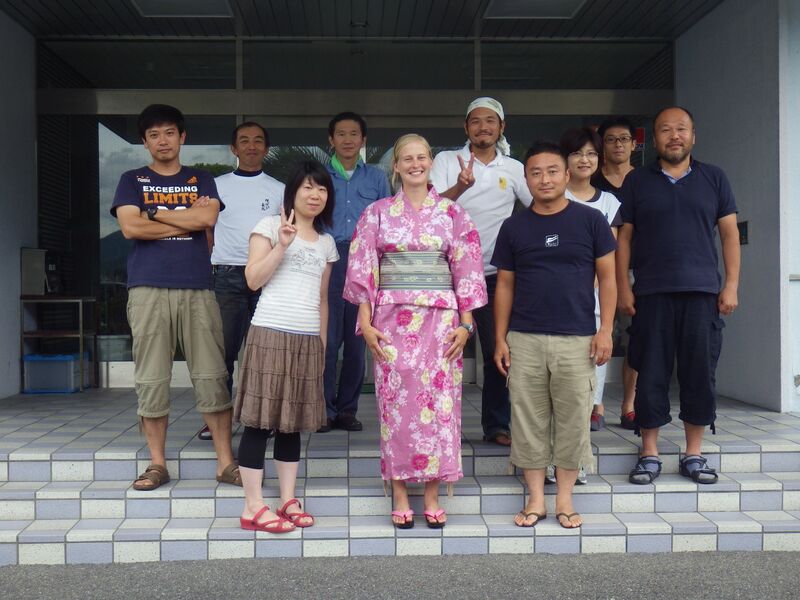 Although my trip was not quite over, this was my last day working with the ZEN team in northern Japan. I truly enjoyed the experience and learned a great deal from our Japanese collaborators. Hands-on experience conducting multiple field experiments in entirely different environments (North Carolina, Hiroshima, and Akkeshi) was eye-opening for me and gave me a new perspective on collaborative research. I have tremendous respect for the ZEN partners all over the world trying to make this project a success in their own unique environments. I’ll end the blog here, but see my and Nicole’s final joint-blog for the highlights from our travels in the land of the rising sun. I like this quote from John Heywood. With the breakdown for the main ZEN experiment in Akkeshi quickly approaching, I became nervous that with only four pairs of field hands we would not be able to accomplish all of the necessary sampling in a timely manner. When I helped break down the ZEN site in North Carolina early this summer we had a small army of seven collecting field samples, removing the experimental materials, and processing the samples. And in North Carolina we were all native English speakers, which streamlined field communication. But, during my time working with the ZEN team in northern Japan I have been constantly reminded that even just a few well-coordinated hands can make a massive amount of work manageable. The breakdown was no exception. With 3 people in the water and 1 person on the boat handing out supplies and organizing the samples, we managed to break down the site in a smooth and efficient manner. Despite our relative lack of numbers, we managed to complete the experimental breakdown with its numerous sample collections in just two trips to the field site. I was amazed by this – not because we completed the work, but because we came to the field from four different countries. A Japanese (graduate student Kyosuke Momota), an American (me! ), a Thai (visiting scientist. Dr. Khwan Whankpetch from Kasetsat University, Thailand) and a Filipino (visiting prospective student Venus Leopardas) all united together under the common mission of the Zostera Experimental Network – to produce great science. The language barrier certainly posed a stumbling block in communicating with one another. This was especially challenging when difficulties arose and we had to work together to come up with a solution or when we were trying to find the best way to divide the work. It is a humbling experience for me because even though I am the foreigner to this country, communication is catered to my native tongue and we speak to each other in English. I wish I could say that I have learned more Japanese during my time here. I’ve mastered niceties such as “good morning” (ohayou gozaimasu) and “thank you” (arigato gozaimasu), but a full conversation is not possible – yet. I continue to be astonished by how many languages the people I have met here not only understand but speak and read. For example, not only does Khwan speak Thai but she is also fluent in Japanese and English. 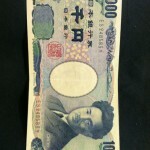 Then there is the matter of the Japanese characters. In addition to learning the English alphabet, Japanese children learn three different sets of characters: hiragana, katakana, and kanji – there are over ONE THOUSAND characters in total! I have only mastered one – the “on” button for the washing machine. Despite the language difficulties, we have learned to anticipate what one another needs and to find creative ways to express ourselves. By choosing our words carefully and speaking clearly we can usually get our point across. However, it is not to be underestimated how much you can say without saying anything at all. Through my experiences here in northern Japan I have come to realize how important thoughtful gestures and facial expressions are in average day to day communication. A smile definitely goes a long way! I have also found the ZEN experimental manual composed by Drs. Reynolds and Duffy to be invaluable. We use it both as a reference for the experimental procedures and as a tool for pointing out questions and providing answers. The methods videos accompanying the manual are also great as they show techniques that can be hard to explain even when everyone speaks the same language. With all of the samples collected from the field, our attention turns back to the lab where the sample processing has begun. Kyosuke and I have been grateful for the help of Khwan and visiting researcher Ms. Venus Leopardas (Mindango State University at Naawan in the Phillipines). We are sad to see them leave as they return to their home countries, but we are happy to welcome ZEN student exchange fellow Rachel Gittman and undergraduate intern Ms. Minako Ito (Hokkaido University) to the Northern Japan team as we finish processing this week. 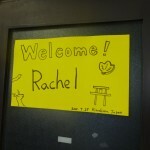 It is great to be reunited with Rachel after working with her at the ZEN site in North Carolina. Stay turned for our upcoming co-authored blog entry “North and South unite!” There we will highlight our last week here in Akkeshi and our experiences as we travel across Japan before returning home. It’s incredible to think that our 6-week adventure is almost at an end! 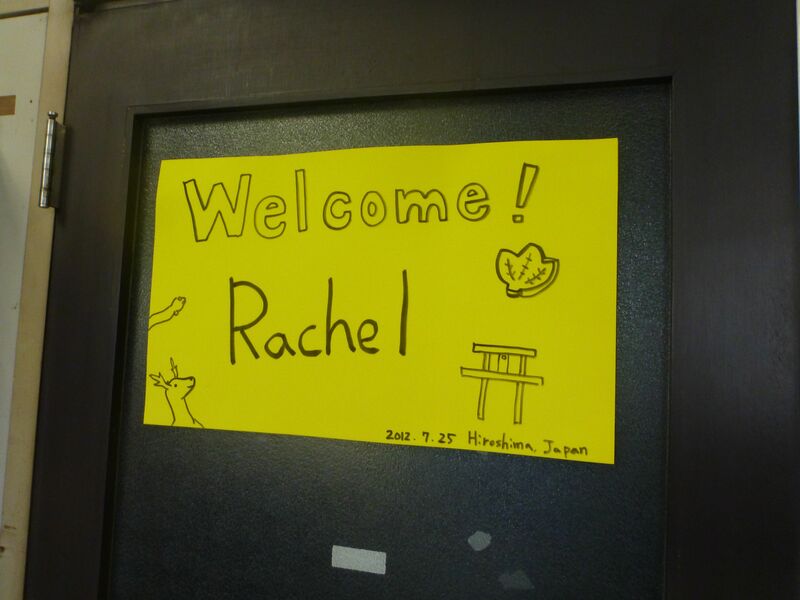 Even though I have only been in Japan for three weeks, I am really beginning to feel a sense of home here. 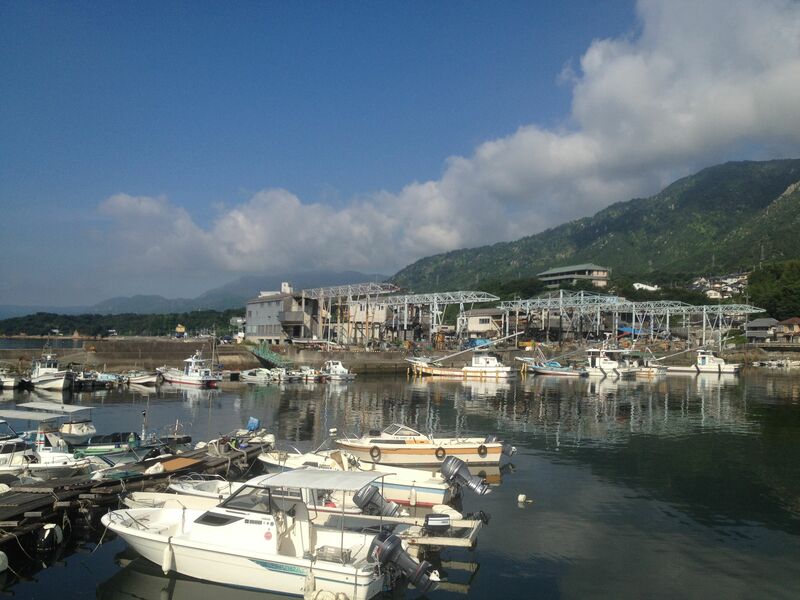 I have experienced so much since my last blog, but the most rewarding experience has been becoming part of the marine lab here in Hiroshima. Hori-san, Hamaoka-san, and Shimabukuro-san as well as the other members of the lab have made me feel both welcome and comfortable. We have lunch and afternoon tea together each day and although I am still struggling to communicate at times (I wish I could say my Japanese is improving, but I haven’t really gotten past basic greetings and responses), I am learning so much. 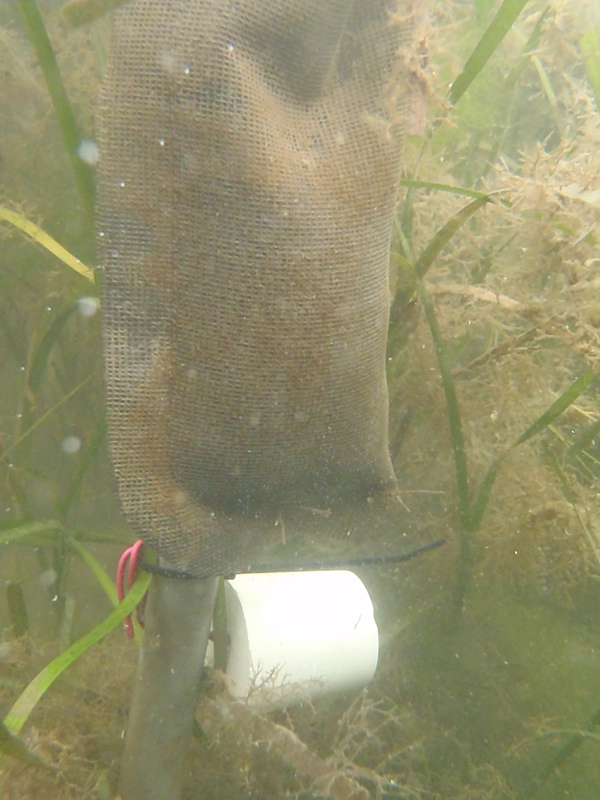 We have been very busy over the last few weeks with two ZEN experiments – a short term assay to examine the intensity of predation on mesograzers and a longer experiment to examine predator effects on the seagrass community. Thanks to the hard work and dedication of the lab, all of the experiments have been running smoothly thus far. After a week of cage building, we were ready to set up the longer predator exclusion experiment. Setting up the experiment here is a little different than setting it up in Virginia or North Carolina because our site is entirely subtidal and it gets pretty deep when the tide rises. 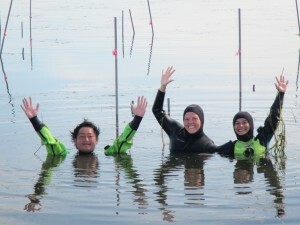 Hori-san and Shimbukoro-san used SCUBA to set the cages, while Hamaoka-san and I snorkeled above them, holding our cages on a long rope leash. The entire set-up took about six hours and I was able to capture about half of the set-up in a timelapse from shore. Although we have been busy with our field experiments, the lab was kind enough to take me out for my birthday and gave me a great birthday present: cake and my own house shoes (very important to have in Japan). It was a wonderful birthday surprise and I am glad I was able to spend my birthday in Japan. I share my birthday (August 6th) with the anniversary of the a very tragic day in history, the detonation of Little Boy, the first atomic bomb used in World War II. 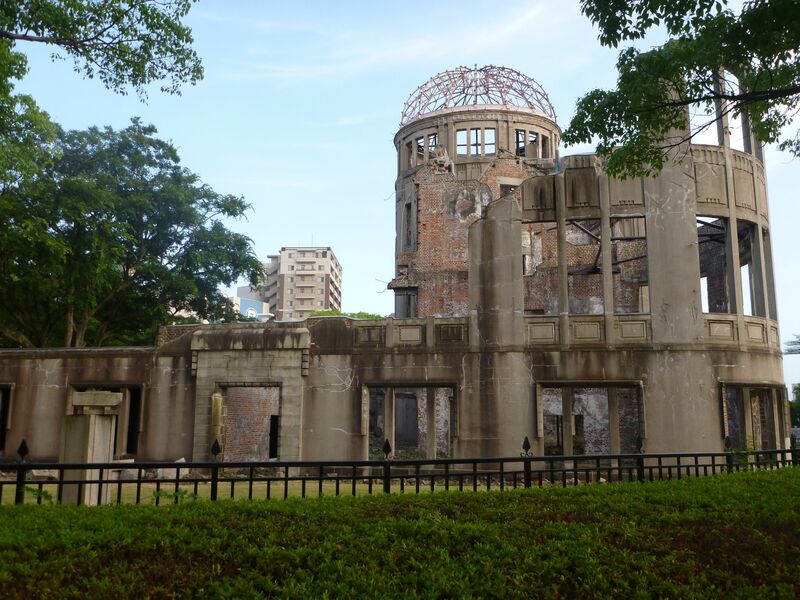 I was able to visit the Atomic Bomb dome, the remnants of the government building that was almost directly below where the detonation occurred, and the Peace Memorial Park. Visiting those sites was a humbling but positive experience because of ongoing efforts by the Japanese people to encourage world peace. 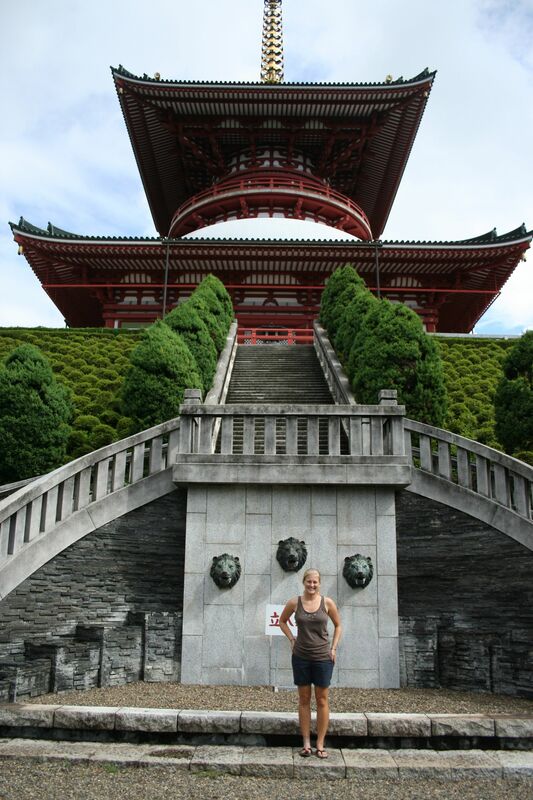 Beyond just seeing the sites, visiting Japan has also been about the experiences and more importantly the food! After much anticipation on my part as an avid sushi-lover, my hosts took me to a Japanese sushi restaurant in Hiroshima City. I could hardly contain my excitement as we sat down to order at the sushi counter. 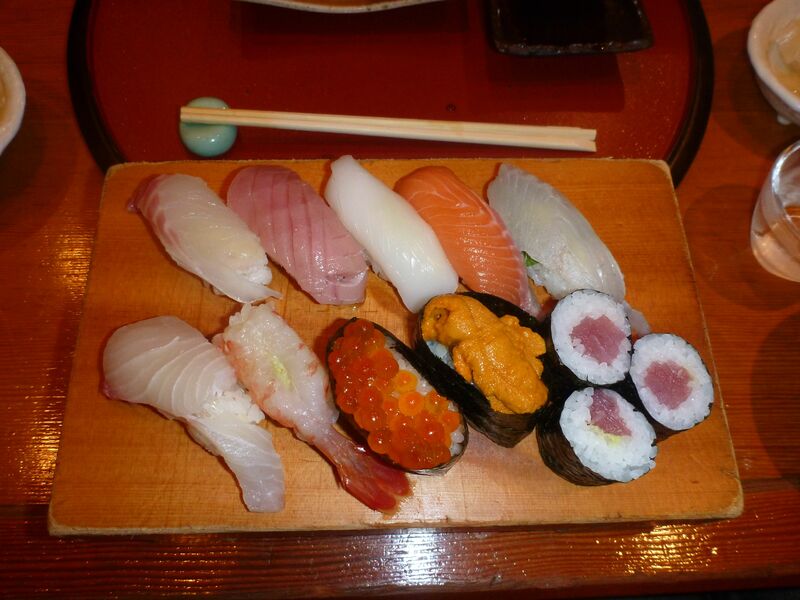 We had a perfect view of the chefs preparing the sushi and I was determined to try everything. Needless to say, I was not disappointed. 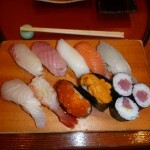 The sushi was amazing and included some items that were new to me, such as squid, octopus, and urchin. 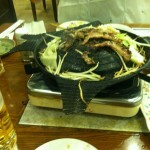 The atmosphere, food, and my new friends made the night one that I am not likely to forget. 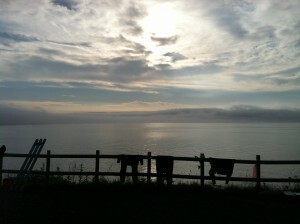 I can’t end the blog without sharing a few more of my site seeing adventures. Over the weekend and this past week, I had the opportunity to visit some of most beautiful and historic places in this part of Japan: Miyajima and the Iwakuni Kintai bridge, in addition to the peace and atomic bomb memorials in Hiroshima City. 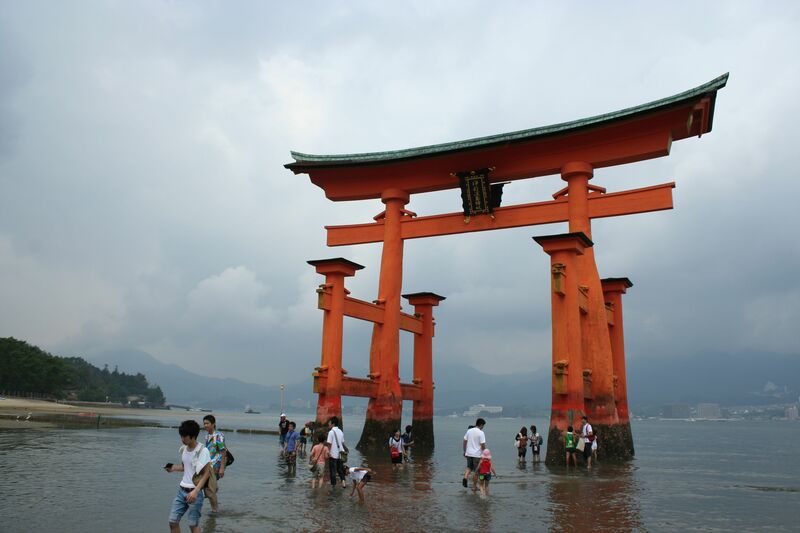 Miyajima is a World Heritage Site just a few kilometers and a short train and ferry ride from the FRA Institute. 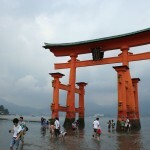 The island contains many historic sites, including the Otorii Gate, Itsukushima Shrine, and Daishoin Temple, as well as nature trails that lead to the top of Mt. Misen. After exploring the temples, shrines, and the public aquarium I decided to hike to the top of Mt. Misen to get a good view of the area. Along the way, I happened to meet a fellow North Carolinian, and we decided to hike up together. It was a good choice, because the 3km hike was very steep and the humidity and heat made reaching the top quite an accomplishment. The view was worth it though and the descent was much more pleasant. 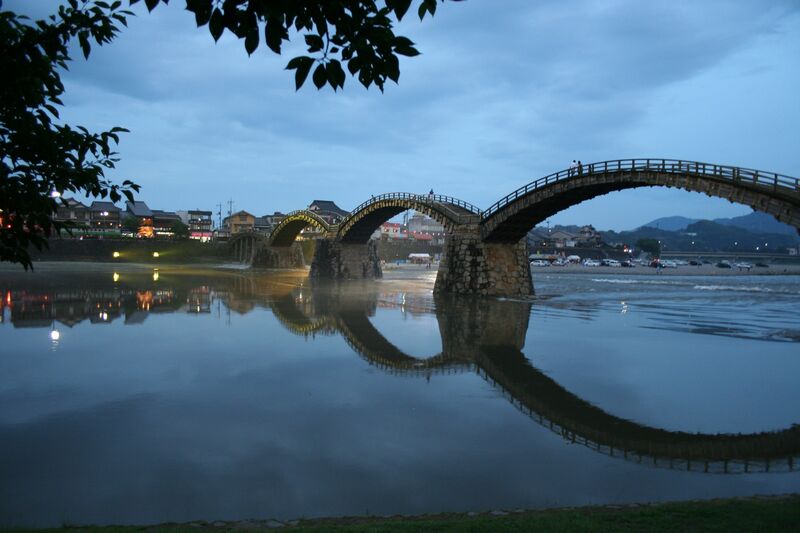 I want to save some of my site seeing for another blog post, but I will briefly mention the Iwakuni Kintai bridge. Built in the early 1600s, it was deemed “indestructible” because of the superior engineering design and construction, well ahead of its time. The bridge is not only impressive from an engineering perspective, it is also incredibly beautiful. Although the bridge was partially destroyed in the early 20th century, it was restored to its original glory a few decades later and it still maintained in its original design and structure. Seeing the bridge just as the sun set was worth the wait. Having to wait for it to get dark also meant I could get more ice cream – this time I went for mango. I am pretty sure I have eaten more ice cream here in the past three weeks than I have for all of last year. What can I say except that it is just delicious! I do not think my wetsuit had a chance to fully dry out this week as we were in the water at the ZEN field site everyday. With several experimental pushes (setting up an experiment to measure predator impacts on mesograzers, maintaining the main ZEN experiment, and surveys of the ambient predator community) it was a busy week for eelgrass science in northern Japan! 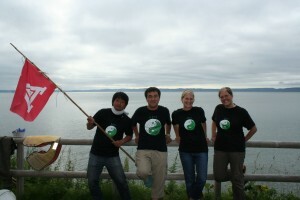 A team of four made maintaining the ZEN experimental plots a smooth and efficient process. We used a canoe to keep bags of plaster blocks, extra cable-ties, and spare scissors easily accessible. While one person paddled around the plots and handed out supplies, the rest of us used mask and snorkel to change the old blocks out for the new. Luckily, the tide was at a good height to make snorkeling easy but the ever-present jellies still makes working at this site quite challenging! 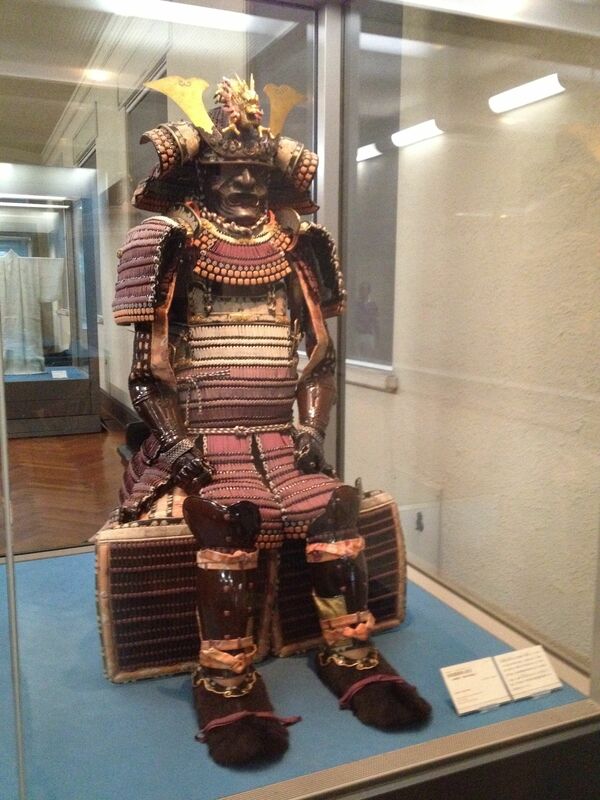 Before traveling to Japan I had never appreciated how creatively scientists can modify their use of the same or similar experimental gear to overcome obstacles posed by working under diverse field conditions. 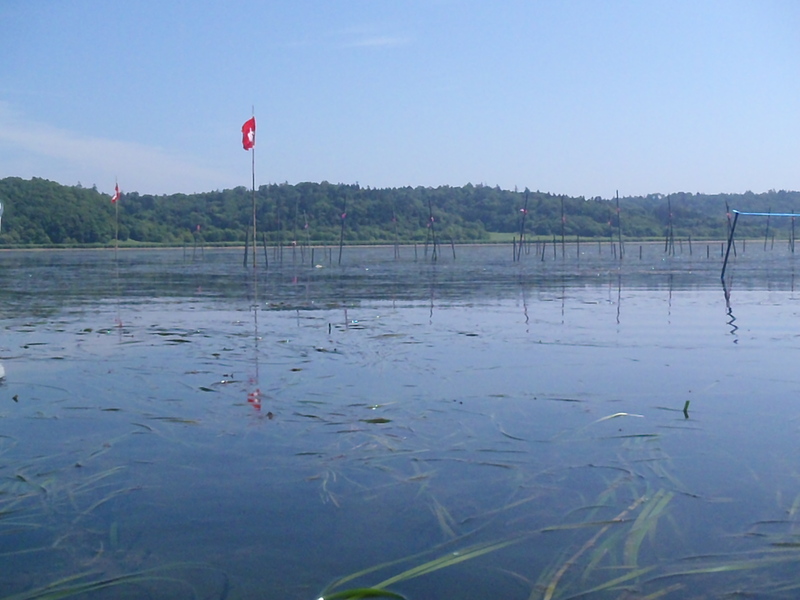 I’ve surveyed small aquatic predators before using a seine net (a large net attached to two poles dragged through the seagrass to capture fish and other predators). 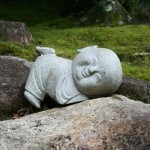 But, I had never seen one used quite like they do at the ZEN site in Akkeshi. 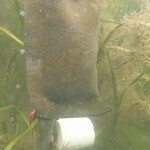 We used a typical seine design (floats on top, weighted on the bottom), but with the addition of a tow net attached to one side of the seine. 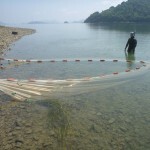 In the water, the seine net was walked out until completely stretched in one direction. Then we walked the ends of the net toward each other to form an enclosed circle. Moving very slowly, we gradually decreased the circle in size until all the fish were forced into the tow net. 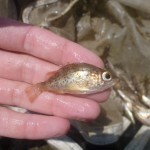 The tow net could then be emptied into a bucket and the fish counted, measured, and released. 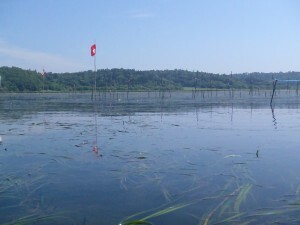 It was an effective design that did not require spending time picking the fish out of the netting of a traditional seine. I think this purse seining technique is similar to techniques that shrimpers and other commercial fishermen use to capture fish in the open ocean, but it’s not something I’d ever seen before. 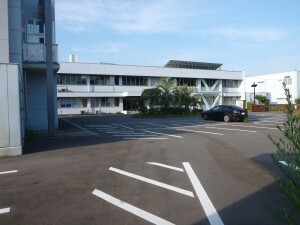 But that’s part of why I’m in Japan – to learn new techniques and do rigorous science at the same time. 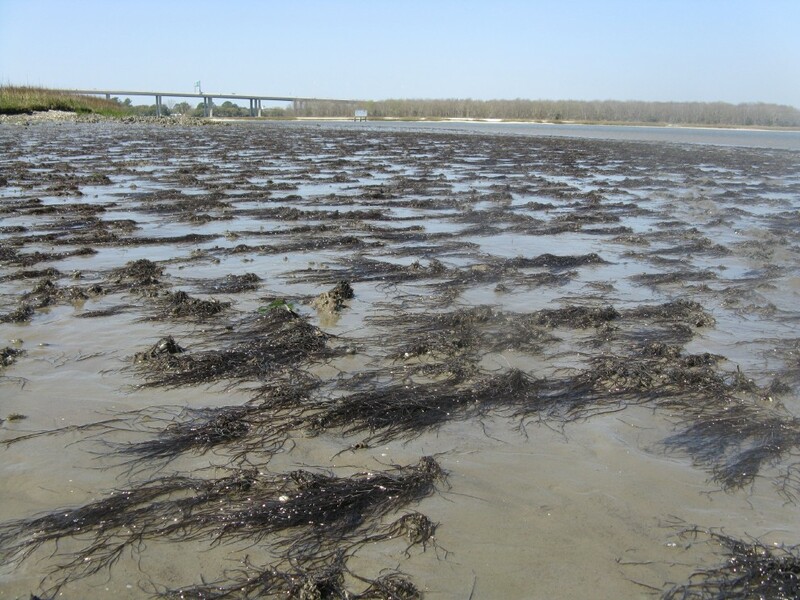 To my absolute delight, after finishing work at the ZEN site one morning we swung by a tidal flat where I could collect samples of the local Gracilaria seaweed for my thesis research. While this species is introduced and invasive in the Southeastern USA, it is native to mudflats here in Akkeshi. The shallow water prevented the boat from getting too close to the shore, so we had to hike over one kilometer in shin-deep mud before we started seeing the seaweed. This happened to be the day when the sun shone bright and my 10 mm worth of neoprene grew unbearable as I made my way through the mud. But the end result of seeing Gracilaria in its native habitat was well worth the exertion and I was able to collect enough samples for my project and make some useful observations. 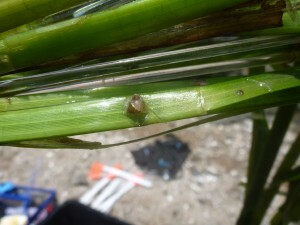 Interestingly, in the Akkeshi mudflats most of the Gracilaria is settled onto the shells of a local gastropod. 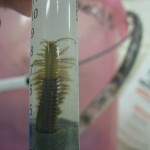 This contrasts to the Southeastern USA where the decorator polychaete Diopatra attaches fragments of Gracilaria to its tube. 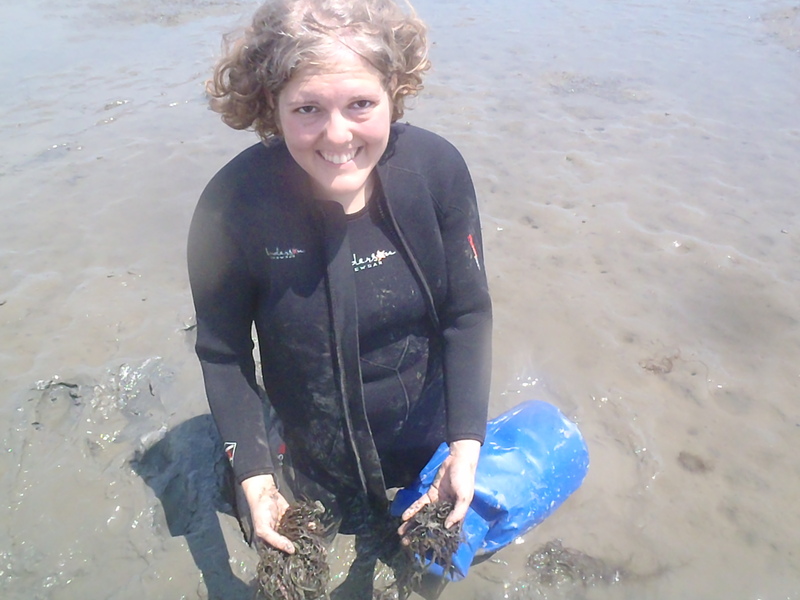 In both cases, the seaweed is using an animal for substrate but through very different mechanisms. I also found amphipods living on Gracilaria. Similar to how the amphipods in the eelgrass beds are larger in Akkeshi than in the Carolinas, the amphipods I found on Gracilaria are gigantic compared to what I have seen in Charleston. A huge thanks goes out to Dr. Nakaoka for facilitating the endeavor, Dr. Honda and Kyosuke-san for hiking through the mud and collecting samples with me, and ZEN for bringing me to Japan! 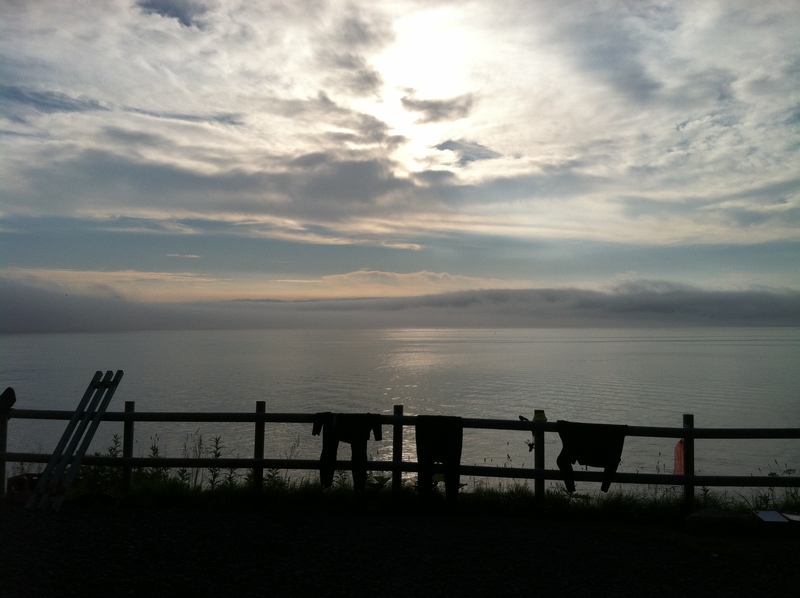 Now at the week’s end my wetsuit finally has a chance to dry out and I look forward to a weekend of rest, a lab dinner party (with the promise of local Hokkaido seafood and good sake), and a canoeing trip up the Bekanbeushi River. “Work hard, play hard” definitely describes the life of a marine field ecologist here in Japan. Otsukaresama (thank you for your hard work) ZEN team! 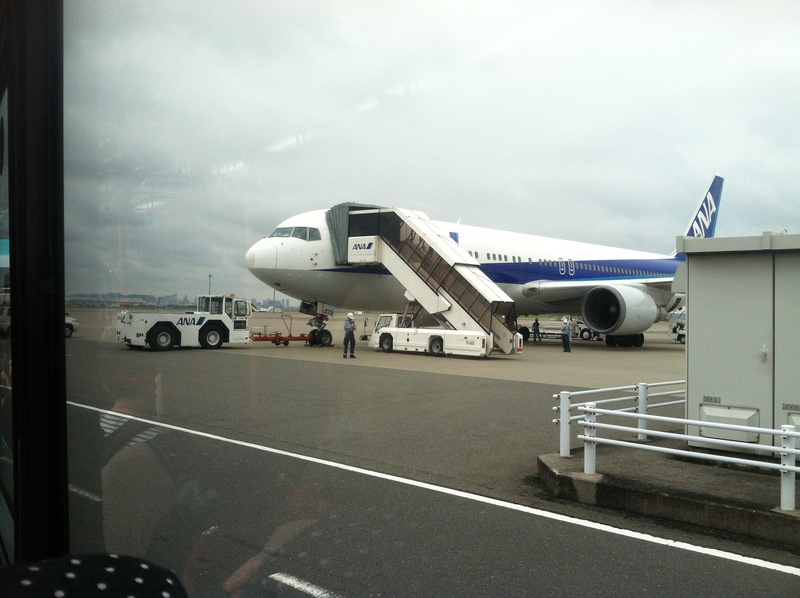 After three flights totaling approximately 17 hours, I finally arrived in Hiroshima, Japan on July 25th, 13 hours ahead and a day later than when I left Beaufort, NC. Although I am still recovering from jet lag (5AM I am wide awake, but 3PM feels like the middle of the night), I have already begun exploring the amazing sights here in Hiroshima. I have decided to do my best to document the trip not only with blog entries, but with photos and a short documentary on the ZEN project here. Prior to my trip to Japan, I participated in a ScienceFilm workshop led by Jeff Morales and Robert Wooten, both previous staff and current freelance documentary filmmakers for National Geographic. 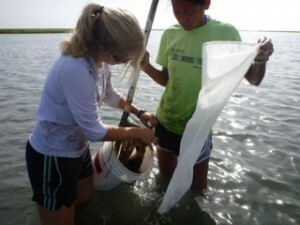 Graduate students at the University of North Carolina at Chapel Hill’s Institute of Marine Sciences and Duke University’s Marine Lab coordinated the workshop. Students learned how to film, edit, and produce science documentaries to help promote their research or important scientific topics. Although the course was brief (5 days), it provided an excellent crash course in filmmaking and hopefully has prepared me for making my own short film about the project here in Japan. Now if I can only remember these key tips: use a tripod, don’t zoom, and lighting matters! Back to Hiroshima… I am working with Dr. Masakazu Hori at the National Research Institute of Fisheries and Environment of Inland Sea (FEIS), part of the Fisheries Research Agency (FRA) in Hatsukaichi, Hiroshima. Dr. Hori is the lead PI for the southern Japan site and is conducting two ZEN experiments this year: the predator assay and the predator exclusion experiment. 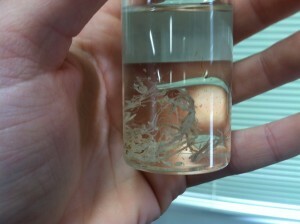 We ran the first predation assay on Thursday and Friday of this week. The experiments are being conducted within a sheltered cove off shore of an island across from the Takehara Fisheries Research Station. To get to the field site, we have to take a boat, which is typical for marine work, but this boat is a little different. 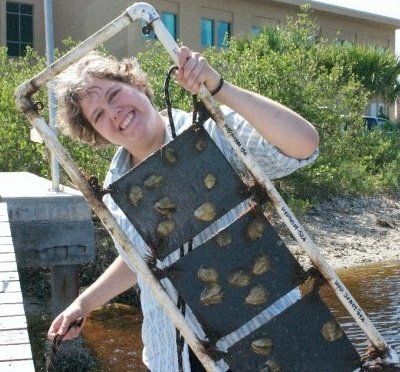 Instead of launching the boat from a trailer or keeping it in the water, each time researchers at the station need to use the boat, it has to be lifted and lowered over the seawall into the water. It’s pretty impressive to watch and it is the perfect way to keep the boat clean! 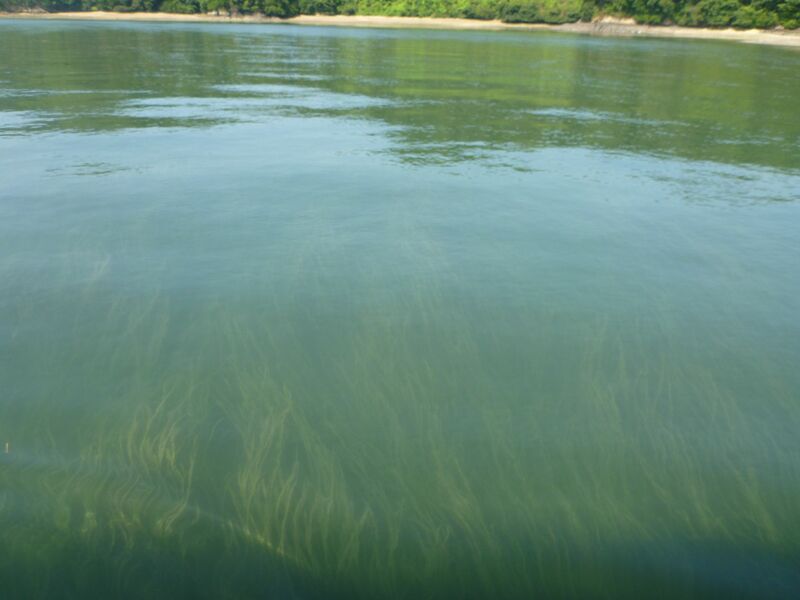 After a 5 minute boat ride, we arrived at our site, a quiet cove filled with giant Zostera marina shoots! I was surprised at how cool the water was when I first got in since the air temperature was well into the 90s oF with high humidity. It was refreshing and although I was a bit wary of the jellyfish graduate student Matt Whalen had encountered last summer, I was soon completely engrossed in exploring the seagrass beds, or forests as I view them. The beds are extremely dense and tall, with most shoots rising more than one meter from the bottom and around 3cm wide! These beds dwarf the beds we have in North Carolina. 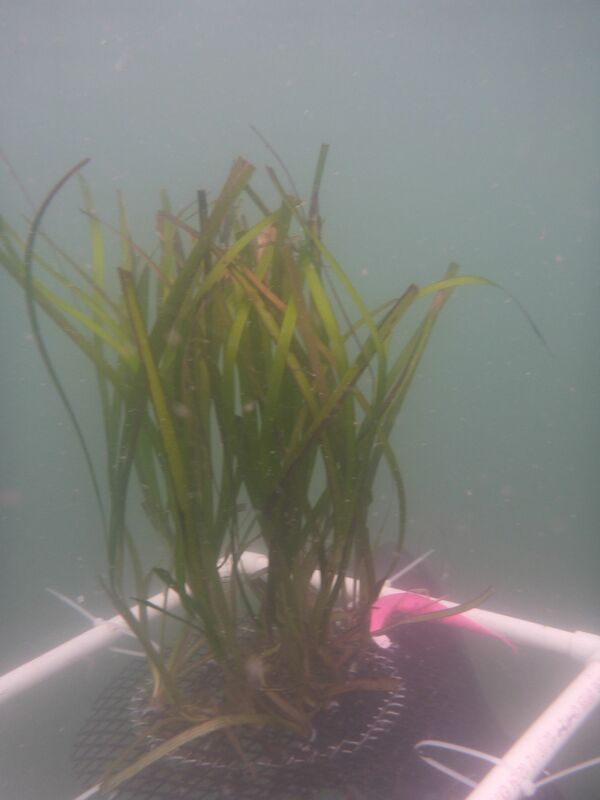 We started an experiment measuring the effects of small crab, shrimp and fish predators, which involved some diving and snorkeling because the seagrass can grow as deep as 10m here! The following day we collected the experiment and found fairly high predation rates, particularly on amphipods. Although I did not spot many fish in my snorkeling adventures, clearly they were lurking in the murky depths of the beds. 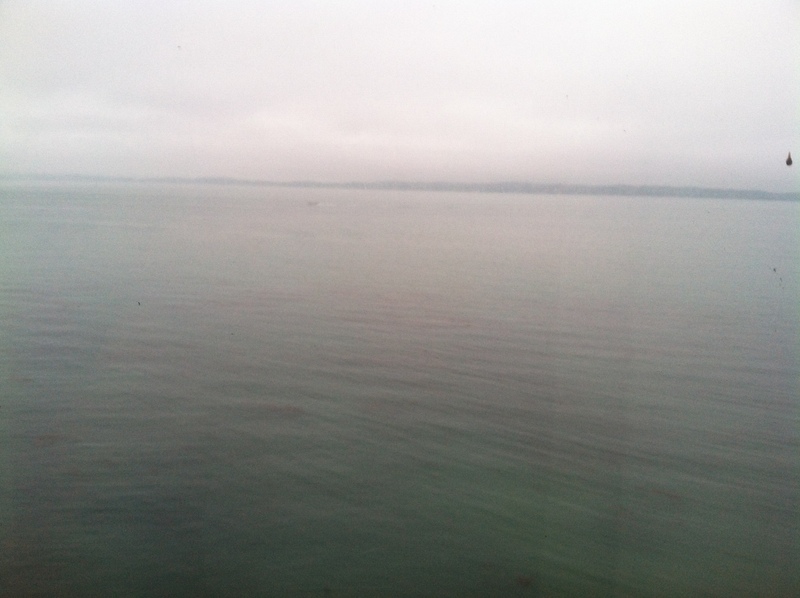 The visibility was poor, similar to our waters in NC, so I felt right at home. If someone told me this time last year that I would be traveling to Japan this summer to study amphipods and 3-meter tall Zostera marina, I wouldn’t have believed it. 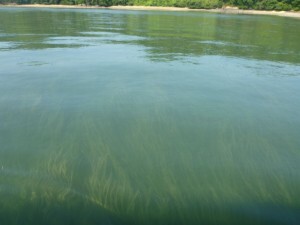 My reason for not believing such a scenario is not because I couldn’t see myself traveling to Japan, or because I didn’t think that seagrass could grow 3m tall, but because I couldn’t imagine studying amphipods. 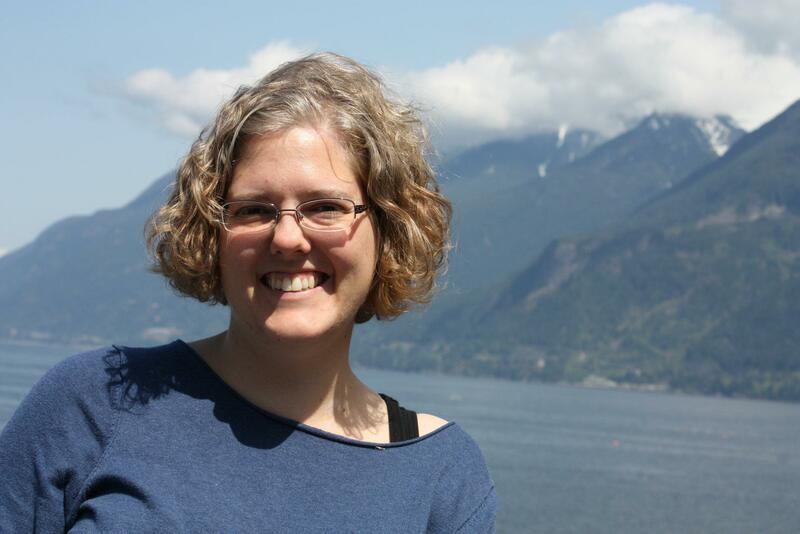 As a former lab mate of Dr. Pamela Reynolds, the post-doctoral researcher coordinating the ZEN project, I received an intense introduction to the world of mesograzers during my first year of graduate school. I swore to her that I would never study amphipods because they were just too small. Yet here I am, working with those amazing little crustaceans for the third consecutive year. I guess “never say never” is a lesson I have yet to learn. Before I go further with my expectations for my encounters with Japanese amphipods this summer, here is some background on me. 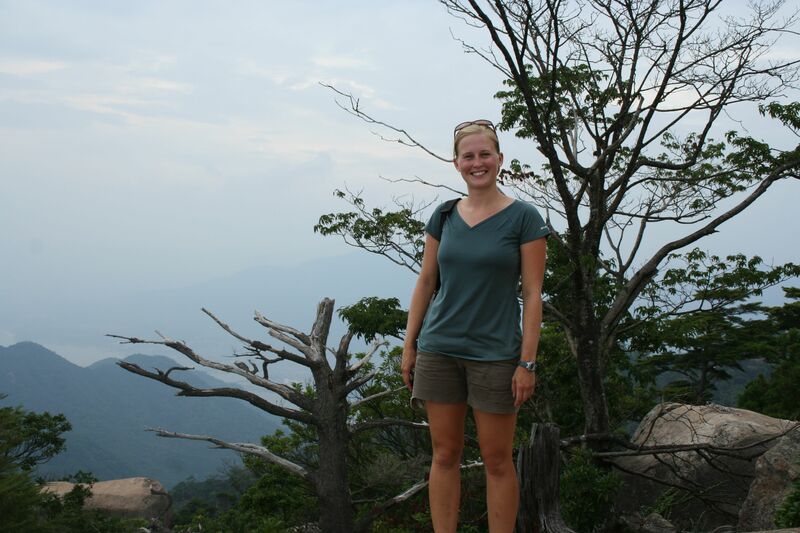 I am a third year PhD candidate in the Curriculum for the Environment and Ecology at the University of North Carolina at Chapel Hill’s Institute of Marine Sciences. My graduate advisors are Dr. John Bruno and Dr. Charles “Pete” Peterson. 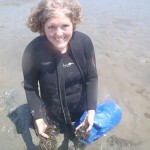 As a marine community ecologist, I am broadly interested in the biotic and abiotic factors that affect the structure and functioning of marine communities. 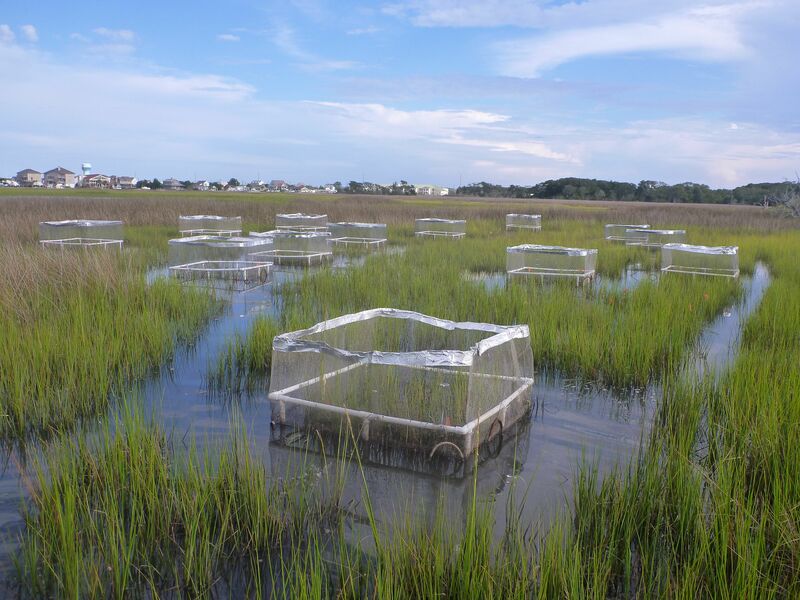 My dissertation work focuses on how two anthropogenic stressors, coastal development and sea level rise, can affect coastal habitats. 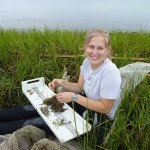 More specifically, through fish community sampling and field experiments I evaluate how artificial shoreline stabilization and increased tidal inundation (a result of sea level rise) can affect the composition and persistence of coastal fish and invertebrate communities that utilize salt marsh, oyster reef, and seagrass habitats. 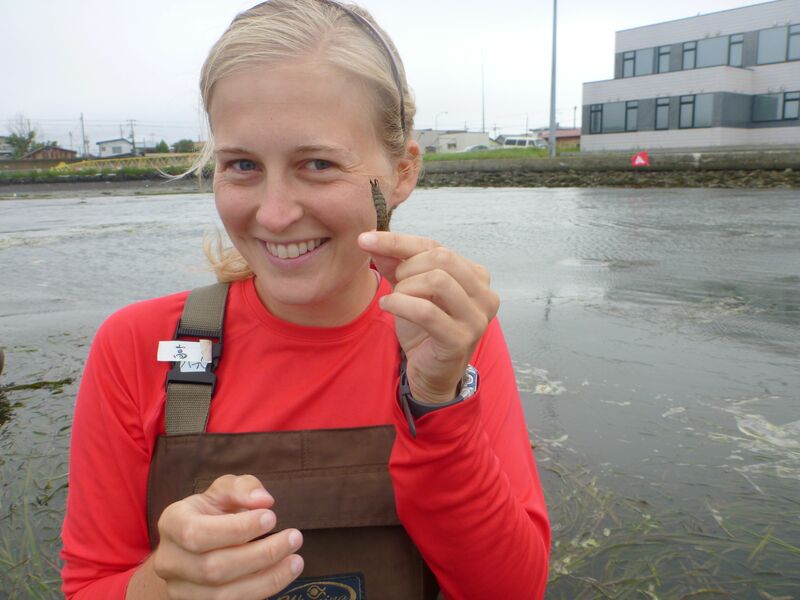 My research often requires me to sample fish at night, trudge through dense, mosquito-infested marsh to survey the plant communities, and count and often tag many a periwinkle, fiddler crab, and other interesting marine invertebrate. 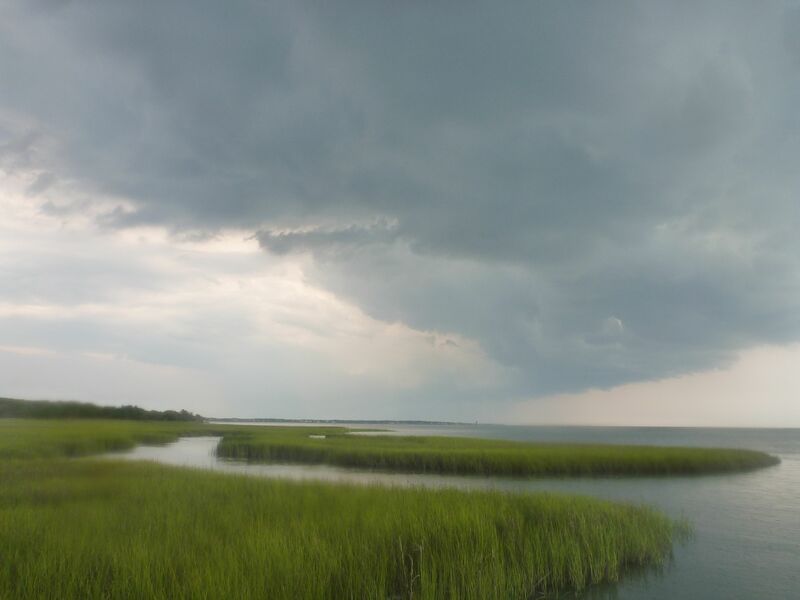 When I am not knee-deep in a muddy salt marsh collecting fish, I somehow manage to still enjoy being outside by running, swimming, kayaking, and walking my dogs. I also enjoy yoga, cooking, gardening, and just in case I don’t already sound a bit older than I actually am, even knitting. When I find the time to get away, I like to check out local music and restaurants, as well as escape a few times a year to the Appalachian Mountains to camp and hike. 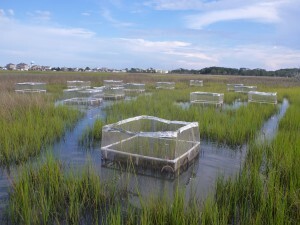 Although my dissertation work has a very different focus than the ZEN objectives, ultimately they both revolve around understanding the factors that affect the health and persistence of foundation species (e.g., the eelgrass Z. marina, marsh cordgrass Spartina alterniflora, and the eastern oyster Crassostrea virginica) that provide critical habitat for marine organisms. It is this parallel that first interested me in the ZEN project and continues to drive my participation in the network. 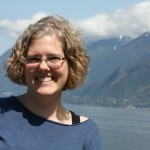 I have been working with the ZEN partners as the North Carolina site coordinator since 2011. 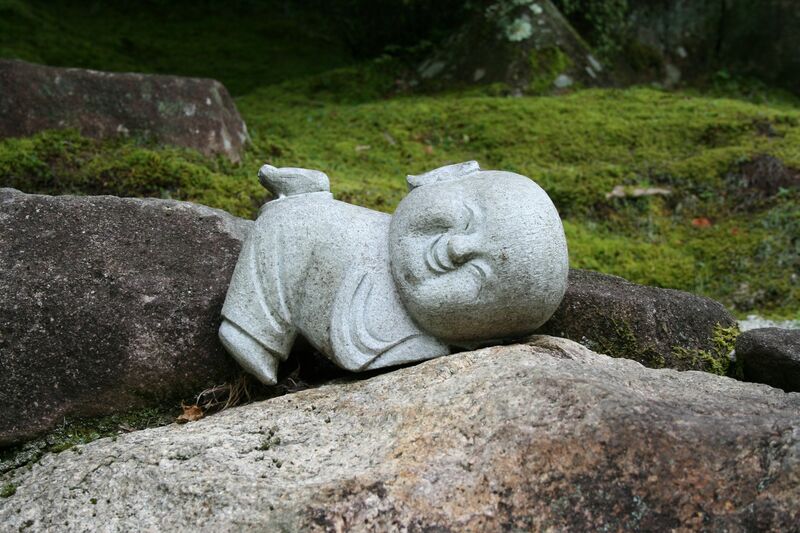 I am very excited to expand my participation in the ZEN project by traveling to both Hiroshima and Akkeshi, Japan, this summer to assist fellow researchers with this amazing project. My primary expectation for this project is that I cannot know what to expect, which is very exciting. 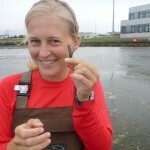 I imagine that the seagrass beds in Japan will be very different from those in North Carolina, which I am sure will pose unanticipated challenges, but also unexpected insights into the dynamic relationships between mesograzers, their predators, and the in-common foundation species Zostera. 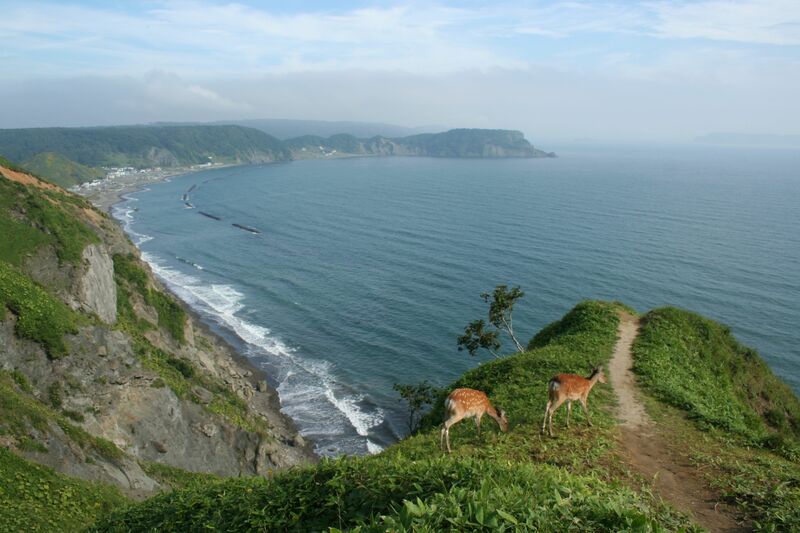 I am looking forward to working with the Japanese researchers and learning more about Japan’s ecosystems. 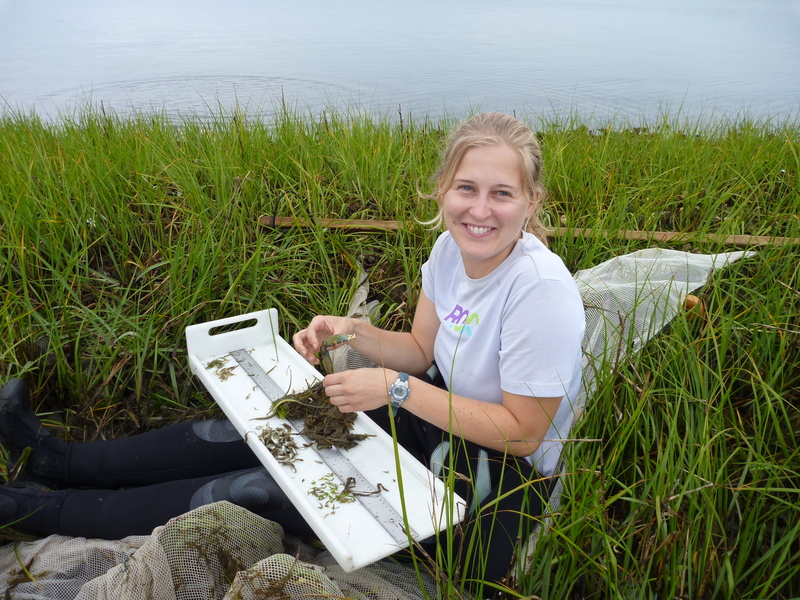 My name is Nicole and I am a Master’s student working with Dr. Erik Sotka at the College of Charleston in Charleston, South Carolina (USA). Erik first introduced me to the ZEN project at the North Carolina site earlier this summer and I am looking forward to continuing my experience with ZEN as a student fellow in Japan! I heard that the eelgrass there is up to a meter long (that’s over three feet!) and I can’t wait to see what else may be different (or the same) compared to the other ZEN site I’ve worked at, Middle Marsh, in North Carolina. My family is from Minnesota and my parents moved back there a few years ago. I learned how to talk while in California, grew up in Washington State, and went to high school in Oklahoma. 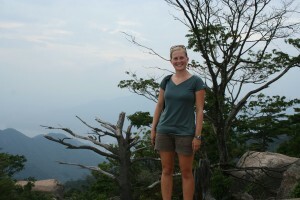 After graduating with my Bachelor’s in 2007 from Western Washington University, I lived in Florida, New York, and Oregon before landing in South Carolina for graduate school. More about me...My favorite color is purple. When working at the fast food restaurant chain Wendy’s, I could make a junior bacon cheeseburger in 3.9 seconds. I swam varsity in high school. I took 9 years of piano lessons. I go a little crazy when given a blank canvas and oil pastels. I really don’t like scary movies or raw onions. Give me a head lamp and a midnight-low tide and I won’t stop smiling for a month! 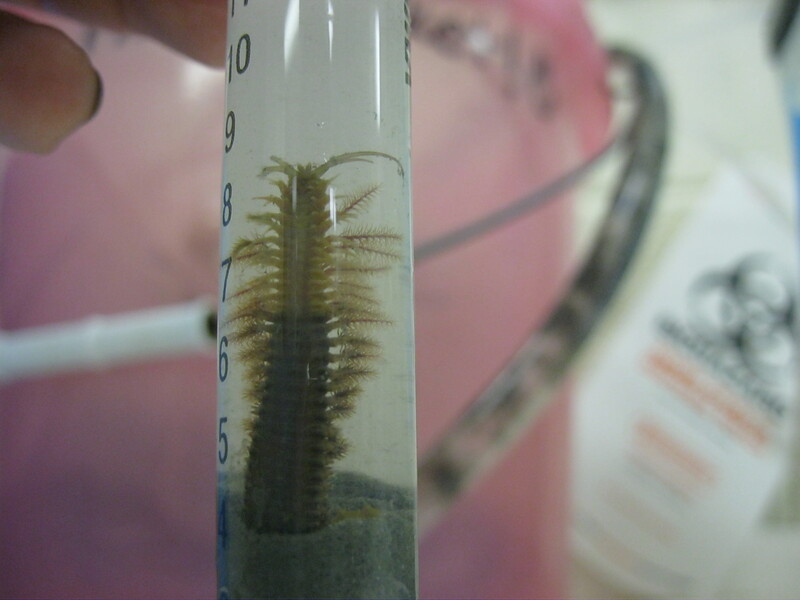 I absolutely love science, especially marine critters. 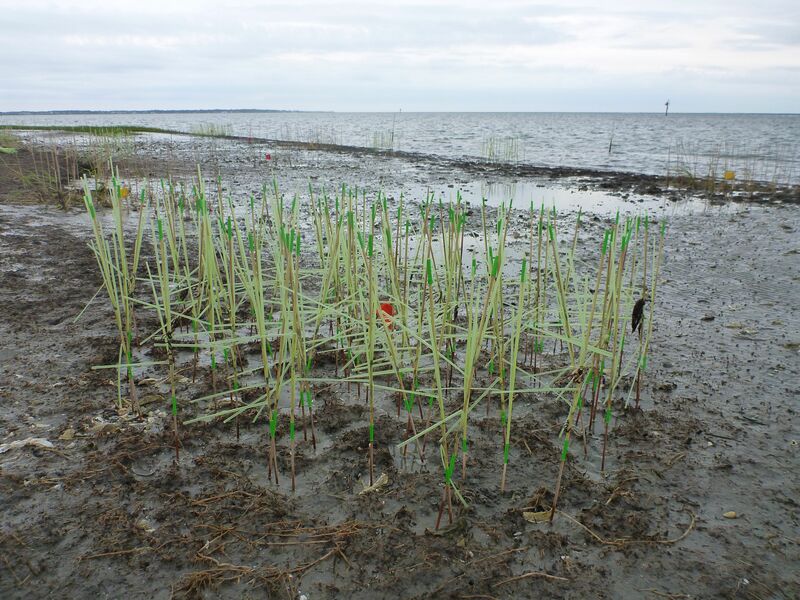 As a Master’s student, I am working with Erik and our collaborator, Dr. Jeb Byers at the University of Georgia, studying the ecological roles of the invasive red seaweed Gracilaria vermiculophylla in the mudflats of the southeastern US. My thesis research focuses on two aspects of this invasion: 1) tracking the invasion history of Gracilaria using a global population genetics approach (if anyone sees Gracilaria and is willing to send us samples please let me know!) and 2) investigating the nature of the relationship Gracilaria forms with a decorating tube worm (the polychaete, Diopatra cuprea). I have spent many a days covered head-to-toe in mud getting to know how Gracilaria looks, feels, and “behaves” in South Carolina, but I have no idea about the ins-and-outs of Gracilaria in its native habitat. How is it different, how is it the same? Well, it just so happens that the type locality for Gracilaria is in Akesshi Bay, Hokkaido, Japan! So I not only have the privilege of helping the ZEN partners in Japan but I also have this amazing opportunity to see Gracilaria in its home waters. It is most definitely a young marine ecologist’s dream come true. It goes without saying that I am really stoked to go to Japan. I am excited not only to take advantage of the opportunity to learn all I can about native Gracilaria, but also to experience a new culture and a new eelgrass bed. I think the most challenging aspect of working in Japan will be the language barrier, but hopefully I will be able to pick up the basics quickly. I have a Japanese friend here in Charleston who is doing what she can to teach me the essentials. I’ll be boarding the plane to Japan with open expectations but I do hope to come back to Charleston with a new perspective on science and life. I’m looking forward to keeping everyone updated with what I learn, see, and experience as I explore the seagrasses and seaweeds of Japan. 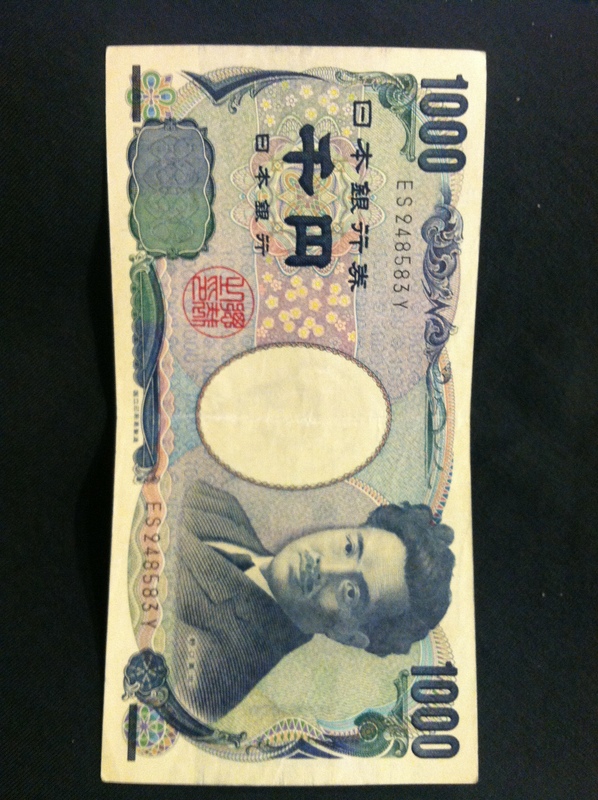 Next time you hear from me, I’ll be in the land of Nihon!